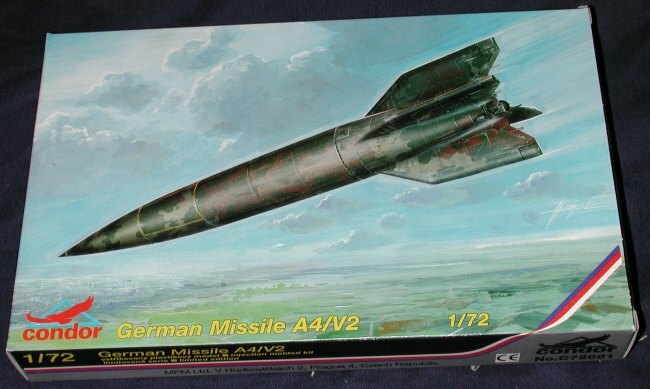 Without a doubt, one of the more terrifying German weapons were the A-4 rockets. These were designed by a team of crack scientists working out of a secret site at Peenemunde on the Baltic coast. The A-4 (more commonly called the V-2), was the first IRBM (Intermediate Range Ballistic Missile) and the first ballistic missile of any kind. Developing this missile was no mean feat. Though design and construction of the A-4 was started before the war, the project was put on hold around 1937 due to a number of failures with smaller test rockets. The biggest problems were engine reliability and guidance. Early engines tended to blow up on the launching pad, not a good sign. The problem was that the engine became too hot so prematurely detonated the fuel. By using the fuel itself to help cool the engine, this problem was overcome. Guidance was another problem. Building gyros that were precise enough to preset the course into, yet sturdy enough to withstand the punishment of lift-off and flight was a real challenge. What was done, was that another test vehicle, the A-5 (which was basically a miniature A-4) was developed and used to solve these problems. Despite additional teething troubles, by October 1944, these problems were cured and the A-4 was operational. Since it had been given a high priority, a large number of these missiles had been built. Well over 5500 of them were fired against targets in England and Holland during the war. Enough were left over that hundreds of them were able to be grabbed by victorious Allies. It was the V-2 and those scientists who developed it that were responsible for the beginning of US and Soviet space exploaration. The best way to describe this kit is Simple. There is basically one sprue which was cut at the factory to fit in to the box. What you get is a missile and the mobile launch stand. Most of the parts are for the launch stand and you do have to stretch some sprue to complete the model. The kit itself is typical of short run kits with relatively large sprue gates, some flash on parts, relatively thick mold seams and no alignment pins. A few sink marks were noticed on some of the thicker and larger bits, though the rocket body itself appears to be devoid of these. Instructions are quite good, with several construction steps showing the painting information where needed. Most of the launching stand is to be painted a 'panzer yellow' color. 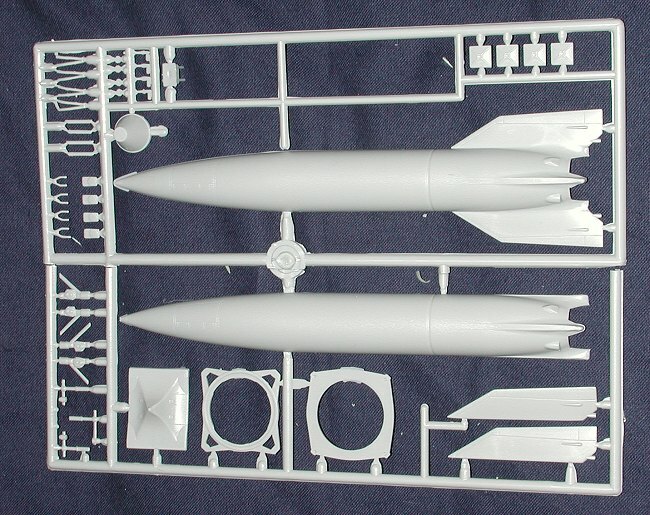 For the missile itself, there are two schemes shown. Both are in sand, medium green and red brown. One is a splinter pattern and the other is a more varied scheme. Four views of each scheme are given, which is quite helpful. There are also various test schemes that can be used. The Monogram Aviation Publications book on the V weapons has a number of excellent photos of A-4s in these schemes and is highly recommended if you can find a copy of it. Overall it is a simple kit and one that should not cause any real problems for most modelers. It would have been nice to have had some decals for common stencils found on all A-4's, but apparently it was felt that it wasn't needed. This will go well with the Planet Models Meiler-Wagen.